Anyone who has ever been on construction sites can tell you they are dangerous places. Working with heavy materials, building at great heights, temporary scaffolding, exposed nails, electrical lines, and gas lines are part of the job, and workers are expected to have a toughness to accomplish the task at hand. If you or a loved one has been injured on a construction site, call Zinda Law Group at (800) 863-5312 to receive a 100% free consultation with our experienced San Antonio construction accident attorneys. Construction is a necessary and important part of our daily lives, and those who put themselves in danger are deserving of protection should they be injured. A Bureau of Labor Statistics study showed that one out of five work-related accidents occurred at construction sites, and one out of 10 labor-related deaths happened there as well. Sometimes these dangers are unavoidable, and the worker must take on a level of risk while strictly adhering to safety standards. Other times, construction site officials, such as operation managers, overlook hazardous areas of the job site or use improper techniques and knowingly put their employees at an unnecessary risk. Most of the time, supervisors ignore the hazards to save time and money with disregard for the worker. When these risks cause injury or even death to a worker, shouldn’t the company be held responsible? At Zinda Law Group, we believe they should, and we are experienced and dedicated to helping construction workers in San Antonio get the compensation they deserve. Who's Responsible for a Construction Injury? Any number of situations can cause injury to employees of construction sites, and not all are simple negligence by a supervisor. Roofing accidents where workers fall through or are accidentally knocked off of the roof, scaffolding failures, and falling debris that hits a worker are a few examples. If a co-worker’s negligence, poor decision-making, or absentmindedness caused an accident, the company can be held responsible as well. The first step to taking action against a negligent employer or co-worker in a construction zone is to know that you have the right to. Some victims don’t take action simply because they are unaware that they can. On top of the physical pain, the burden of medical bills, lost wages in the present and future, and the toll that can be placed on the family of an injured construction worker can be devastating. It is your right to be compensated for these hardships, and we are prepared to help you with that. 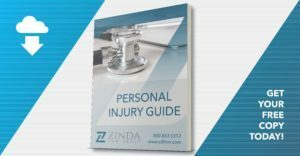 With the help of the personal injury attorneys at Zinda Law Group you can get the protection you deserve. We work hard in San Antonio representing employees who are injured on construction sites. Because we don’t get paid unless you do, you can rest assured that our interests are aligned in holding the responsible party liable for the injuries that have been inflicted upon you. To learn more about how we can help you, call Zinda Law Group today at (800) 863-5312 for your free consultation with our skilled and knowledgeable construction accident attorneys.